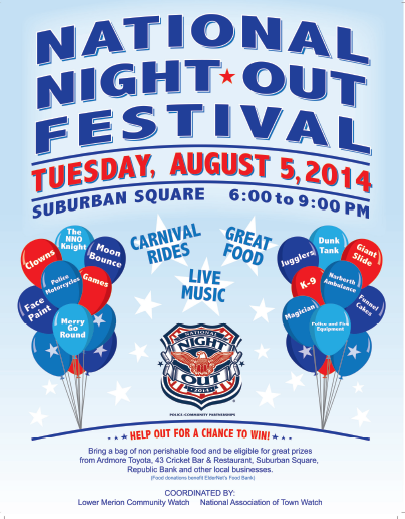 ** NEW LOCATION **The 34th annual National Night Out festival returns and will be held in the Wynnewood Shopping Center this summer. Join us on August 1st at 6PM in the parking lot behind Giant and Anthony’s Coal Fired Pizza. – Food (including funnel cake) and drinks. – Entertainment (clowns, face painters, magicians, etc.). – Lower Merion Police, Fire, EMS. – Local businesses and groups. National Night Out is an annual community-building campaign that promotes police-community partnerships and neighborhood camaraderie to make our neighborhoods safer, more caring places to live.Millions of neighbors take part in National Night Out across thousands of communities from all fifty states, U.S. territories, Canadian cities, and military bases worldwide on the first Tuesday in August. Learn more about the program at https://natw.org/ today.